The example is made in Caron Simply Soft, a soft worsted weight yarn. Dec5 – Decrease 5 stitches – (yo, insert hook in next stitch, yo and pull up a loop, yo and draw through 2 loops on hook) five times, yo and draw through all 6 loops on hook. DecCluster – in ch sp indicated (yo, insert hook in ch sp, yo and pull up a loop, yo and draw through 2 loops on hook) three times, skip next ch sp, in next ch sp (yo, insert hook in ch sp, yo and pull up a loop, yo and draw through 2 loops on hook) three times, yo and draw through all 7 loops on hook. The beginning chain should be a multiple of 16. Row 1: Skip first 4 ch (counts as first dc), dc in 5th ch from hook, dc in each of next four ch, 3dc in next ch, dc in each of next five ch, dec5 using the next five ch, dc in each of the next five ch, ** 5dc in next ch, dc in each of next five ch, dec5 using the next five ch, dc in each of the next five ch. Repeat from ** across to last 7 ch, 3dc in next ch, dc in each of next 6 ch. Turn. Row 2: Ch1, sc in first dc, sc in each dc and dec5 across row. Sc in top turning chain. Turn. Row 3: Ch3 (counts as first dc), dc in 2nd sc, dc in each of next four sc, 3dc in next sc, dc in each of next five sc, dec5 using the next five sc, dc in each of the next five sc, ** 5dc in next sc, dc in each of next five sc, dec5 using the next five sc, dc in each of the next five sc. Repeat from ** across to last 7 sc, 3dc in next sc, dc in each of next 6 sc. Turn. Row 4: Ch1, sc in first dc, sc in each of the next 5 dc, (chain one, skip one dc, sc in next dc) across row to last 4 dc and turning chain. Sc in each remaining dc and top of turning chain. Turn. Row 5: Ch3 (counts as first dc), dc in 2nd sc, dc in each of next three sc, ch1, (cluster, ch1, cluster) in ch sp, (ch1, cluster in next ch sp) twice, ch1, DecCluster (uses next three ch sp), (ch1, cluster in next ch sp) twice, ch1. ** (Cluster, ch1, cluster, ch1, cluster) in next ch sp, (ch1, cluster in next ch sp) twice, ch1, DecCluster (uses next three ch sp), (ch1, cluster in next ch sp) twice, ch1. Repeat from ** across to last ch sp and six sc. (Cluster, ch1, cluster) in ch sp, ch 1. Skip one sc. Dc in each of the next five sc. Turn. Row 6: Ch1, sc in first dc, sc in each of the next 4 dc, sc in ch sp, (chain one, sc in next ch sp) across row to last 4 dc and turning chain. Sc in each remaining dc and top of turning chain. Turn. Third to last row: Ch3 (counts as first dc), dc in 2nd sc, dc in each of next four sc, 3dc in next ch, dc in each of next five sc and ch, dec5 using the next five sc and ch, dc in each of the next five sc and ch, ** 5dc in next ch, dc in each of next five sc and ch, dec5 using the next five sc and ch, dc in each of the next five sc and ch. Repeat from ** across to last ch and 6 sc, 3dc in next ch, dc in each of next 6 sc. Turn. Second to last row: Repeat row 2. Last row: Repeat row 3. Finish off and weave in end. This is beautiful. Thank you for sharing your great work. Bless you for giving different sizes and the repeat, that’s wonderful! I wish more patterns had the repeat as I like to make generously sized blankets. Beautiful work! When I have made things using other patterns, I very often resize them. On all my pattern books, I write in pencil the repeat so that I only have to figure it out once. I really want anyone using my patterns to be able to adjust them however needed to meet their needs, so I do try to provide as much helpful information as possible. I love the pattern and am excited to start my own afghan. I looked through the directions and I have a question about ROW 5. I don’t see the end of the repeat. ROW 5 ends with (ch1, cluster in next ch sp) twice, ch1. I don’t see the instructions for the end of the row and to turn. Do I dc to the end? Thanks for you help, your work is beautiful! Thank you for catching that. I had left off the end of the row, plus found an error at the beginning with one too many dc. I have now corrected it in the pattern. Love all your patterns! This is the first one I have tried but have your page bookmarked and hope to do them all eventually! Thank you! You are right! Thanks for catching that. I have corrected it in the pattern now. As you can tell I am very new to this… In Row 2 when do I dec5? Hope you can help. I am very excited to start this project. It is a beautiful pattern. Thanks for your help. Sorry for the confusion. In row 2 you are just making sc. The dec5 is in reference to stitches from row 1 that you will make sc in. BEAUTIFUL! Thanks for sharing! I look forward to working on this. Now to decide what color. Hey, this is a lovely pattern, and I’m really enjoying it. I do have a question, however. I’m just about halfway through row 5 for the first time, and it’s coming out very ripply, as if there are too many stitches to keep it straight. Is it supposed to be this way, or could I be doing something wrong? Also, are the (cluster, ch1, cluster, ch1, cluster) sets and cluster decreases supposed to match up with the rises and falls in the previously established rows? It shouldn’t be very ripply. If it was just a bit looser than the prior row I think that would resolve with the next row of sc and chains. Yes the increases and decreases should line up with prior rows. If they aren’t, that would definitely cause weird ripples. On row 4, do you have a skipped dc for each chain? Hi, I tok up crochet Monday, made a baby bonnet Tuesday and half way through a plain pram blanket now. I am looking through different patterns and in some cases it states’start your chain in multiples of 16′ ect Could you please explain? Thank you from a G.B follower! I always give the multiple of the repeat and additional stitches for the beginning chain so that anyone can make any size blanket they want. I also give several widths and beginning chain counts so that you can just make one of those sizes and not have to calculate the beginning chain. I think you are wonderful for providing different sizes of your afghans with the amount of yarn for each size and the repeat info. That is my complaint with most crochet pattern books, they don’t give you enough info to change sizes. I make lapghans for nursing homes and your patterns are wonderful. Thank you so much for sharing!! I’m sorry to bother you; I’m fairly new at crocheting and had a question on row 5. When the instructions say (ch1, cluster in next ch sp) twice, does that mean twice in the same ch sp? Or once ea in the next two ch sps? I must be doing it wrong because my inc and dec aren’t lining up, but I don’t want to start over til I find out for sure. Thanks for posting your lovely patterns! No bother at all. (ch1, cluster in next ch sp) twice is once each in the next two ch spaces. My first time seeing your patterns and OMG, they are gorgeous! I have done simple projects earlier in life but now have the luxury (time) to take up crocheting.I have browsed through many sites searching for the perfect project for my level and improve. Your patterns are exceptional! New to reading patterns and am so glad you have diagrams too. Finally! patterns with information on how to change sizes! You have put so much effort in providing all the infomation for which I am very grateful. I am so excited to start this pattern.Hope it is as easy as everyone makes it sound! can’t wait to get to the purple vintage one for my mother after a little more experience. Thank You, Thank You. I’m confused about Row 2. I know that it’s just a single crochet all the way across; but when it comes across the dec5, do you single crochet in all sections of the dec5? Maybe you have a close up of that section so I can see what it’s supposed to look like? The top of the dec5 from row one is a single stitch, so only one sc will go in it on row two. Could it be that my dec5 stitch is too loose? How do I attach a pic of that section of my project. I have been crocheting for many years, but for some reason I am struggling with the beginning of this pattern. I chained out 208 for the Extra Large version of the pattern, and made it all the way to the end of the row, and can’t make it match in any way whatsoever, to the end of row directions. I rechecked my row to see if I missed any stitches along the way, but everything is correct. Any ideas what could have happened? across to last 7 ch, 3dc in next ch, dc in each of next 6 ch. Turn. This is a beautiful pattern, I fell in love with it as soon as I found it. I was taught to crochet by my Grandmother when I was a child but I did not keep it up. I recently decided to “teach myself” how to crochet. I crocheted a pair of simple slippers and a dishcloth and thought I could also master this pattern but it has been a challenge. Although it is a challenge, I am not ready to give up. I experienced some of the same things as mentioned in other messages. I finally determined the ch sp for row five was the area where I skipped over one dc. Once I had that resolved it was less ripply and the increases and decreases lined up. I am now on row six and I am not sure what the ch sp is – do I just single crochet in each space created in row 5? This probably sounds crazy to experienced crocheters but for me the ch sp is a bit confusing. I’m sorry this one has been challenging. You are right that you will sc in each ch sp from the prior row and chain between each one (except for the few stitches on the edges). The pattern does not specify whether the rows are to be worked in the back loops, front loops, or both…I tried using both loops, but it does not seem to be looking quite like the photo above. Thanks in advance for your help! I worked in the front loops. I didn’t specify because it’s really personal preference on this particular blanket since it only affects the borders. The body of the blanket is all worked in chain spaces. Thanks for answering!!! I always want my finished product to look exactly what it looks like in the picture, LOL. Love this pattern and several of the others – can’t wait to try them! I’m especially excited about trying some of the patterns for homespun/boucle yarn! I really like this pattern. I’ve read all the comments from above and I know I’m missing something. Row 6 in the “hill” is it supposed to be a sc, ch1, sc in the ch sp? All the “hill” and “valley” creation is done in the cluster row. For the sc row, just make sc’s in each of the ch-1 spaces and a chain between. Mama this is such a beautiful pattern thanks for sharing. Please explain the decluster. Imjust dont get row 5. Here is a video tutorial I found of a cluster. In this tutorial the stitches are being made into a chain. For this afghan the stitches are made into a chain space. 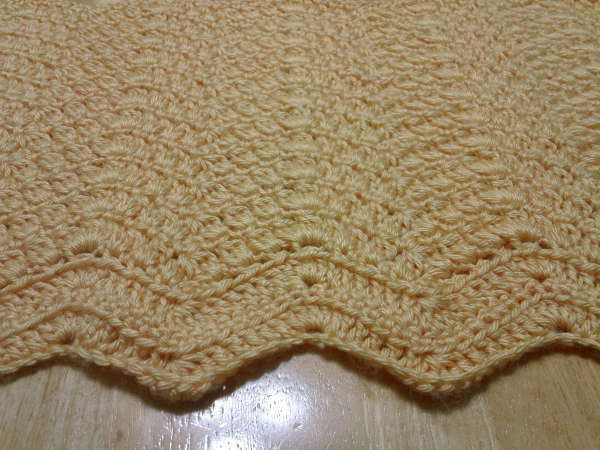 I have been crocheting for several years and have never found a ripple I have been able to do. This one I haven’t had any issues with. I do have a question about Row 4. After the initial 6 SC is it just (Ch1, skip next dc, sc) across to last 4. There was no * showing a repeat and I got a bit confused. Looking at the next row it seems it is but I want to make sure. Yes. The repeat was so simple I just put it in parentheses. This is the same as the old fashioned Chevron pattern, of which I’ve made dozens of times, except for two changes, you call the stitches worked together as “clusters” and the border is configured right in-BONUS! Thank you for sharing! I love the color you used what color? Thank you so much for this lovely pattern. I just have a question about row 6. It says single crochet, chain, then sc again in the next stitch, instead of skip a stitch after the chain 1, as in row 4. Is there supposed to be a skip in between? It just seems there are going to be too many stitches if a stitch is not skipped, but I could be wrong. Thanks! It says to sc in the chain spaces. The chain spaces have clusters between, so you are skipping a stitch. Yes, I see that now…silly oversight! Thank you! I am not a beginner crocheter, but I’ve never made an afghan (been too busy making stuff for other people), but I am finally ready to sit down and make my first one. Would you recommend this for someone like me or is there something else that might be better for a first afghan? Thank you, and I LOVE your work! I think it would be a good first afghan. Since you are not a beginner crocheter, you will want to make something that isn’t too simple or plain. With afghans you want something that will keep your interest and not get boring. I think ripples are good about keeping a little variety, and then this one having a two row repeat helps with that too. It is simple enough that once you get the hang of it, you won’t have to keep the pattern with you, but has enough variety that you aren’t bored with it before finishing. I’ve just finished this for a friend’s daughter to take to college with her. It is gorgeous! So much so, I’ve been asked to make one for my mom as a Christmas present from my step-dad. This one to fit a queen size bed! Thank you. This is a beautiful pattern. Thanks for the pattern, it appears to be well written. I can’t wait to make this one. It looks very elegant in the color shown. I am having trouble with row three…the hills and valleys do not match up. My chain stitch number is correct. Rows 1 & 2 are correct but then things go badly. I’m making the small version. Would you please give the number of stitches for each row? I think it would be helpful to others, too. Thanks so much. Small starts with a chain of 160. It has border stitches and 9 ripple repeats. Row 3 – 6 dc on each border (one is 3ch counted as dc), each repeat has 15 dc and one dec5. There is one extra dc on the last repeat (to mirror the peak on both ends). This is a total of 148 dc and 9 dec5. Row 4 – 6 sc on each border, each repeat has 8 sc. This is a total of 84 sc. Row 5 – 5 dc on each border (one is 3ch counted as dc), each repeat has 7 clusters and 1 DecCluster. There is one extra cluster on the last repeat (to mirror the peak on both ends). This is a total of 10 dc, 64 clusters and 9 DecClusters. I am having trouble with the 3rd row. When I reach 3dc in next sc that puts me at the 1st dc of the three dc in sc from 1st row which leaves the other two dc which in turn throws my ripple off because I would need to do seven dc to be lined up by the next dec5 and the 3dc would be off as well. Thanks for your help! That is correct that the 3dc will be in the sc that is in the first of the 3dc in row one. Then 2 dc will be in the 2 sc that are in the other 2 dc of the 3dc of row one. Then 3 dc will be in the next 3 sc which are in the first 3 dc following the 3dc. So then you have 2 sc that are in 2 dc from row 1, 1 sc that is in the dec 5 of row one, and then 2 sc that are in 2 dc from row 1. Those are the 5 stitches you should use to make your dec 5. The dec 5 will use 5 stitches with the center one being over the dec5 of the previous row. Thank you so much for your quick response especially during the busy holiday season. I am still not lining up right when I reach the dec5 so apparently I have done something wrong in the first row even though I checked it all before I started the 2nd row to make sure everything was correct. Or perhaps I inadverently added some extra sc in the 2nd row. But I will start over and hope it comes out ok. Thank you so much for posting this lovely pattern and Happy Holidays! This is a beautiful pattern and very fun to work! I have a question about row 6. The pattern says to sc in the chain spaces but there are no chain spaces between the 3dc groups in the clusters. It seems like I need to put a sc in between each 3dc group. How should I work the clusters? Please explain your question further. There are ch 1 stitches between each of the clusters in row 5, so I’m not understanding. Thank You for your pattern enjoyed making the afghan. Hi! thank you for creating this wonderful pattern. I am having some issues with R1. I chained 208 and when I got the end (ending with a peak) and got the remaining 7 stitches, it looks wonky. If I complete the 7 stitches, I would have what looks 2 peaks in a row. Is that correct? With 208 beginning chains you will have 12 repeats. This will result in twelve valleys and eleven peaks and two partial peaks (3dc). On row one, you skip 4 chains and dc in the next 5 chains. The next chain is your first partial peak, the 10th chain. The next 15 chains are used for 5 dc, the valley which uses 5 chains and another 5 dc. So the first full peak is in chain 26. There is a peak every 16 chains, so in chain 42,58,74,90,106,122,138,154,170 and 186. The rest of that last repeat uses the next 15 stitches for the sides and valley. This should put you on chain 201 and ready to put the last partial peak in chain 202. The only section I could find that referred to 3 and twice was “DecCluster (uses next three ch sp), (ch1, cluster in next ch sp) twice.” Is this the part you are asking about? The DecCluster is worked over 3 ch-1 spaces. It is only worked one time. The ch 1 then cluster in next ch sp is worked twice, meaning a cluster is worked in each of the next two ch-1 spaces, separated by a ch. Like a previous post, I am having difficulty with row 3 of the pattern. I am working the large size. If I dec5, each rise and fall is moving one stitch to the left and none of the rises and falls are lining up. If I dec4 instead of dec5 all line up, row 4 is correct, but then I am off on row 5. I have started this from the beginning 4 times and I am correct to row 3. So, do I have the most current pattern? I printed mine 2-27-14. I really like this different version of a ripple afghan and would like to get past the 3rd row. Thank you! Thank You For The Visual Illustration…Helped me With Row 5 Tons! Just found your site, so many lovely things, best site I’ve seen so far, just want to make all the Afghans/blankets. I’m making things for perm babies at Nottingham Queens hospital. This one I think I will crochet for myself. Your patterns are the best! I keep coming back to them! I am about to start this one, and I want to make sure – I’m going through BOTH loops on this one, right? (the last one I did was one of yours and was only in the front loop) thanks!!!! Never mind! I just found my answer a bunch of comments above! I would like to know if all of the corrections have been done to this pattern before I start? If they have do you have a corrected version of this pattern? All corrections have been made in the pattern as it appears. 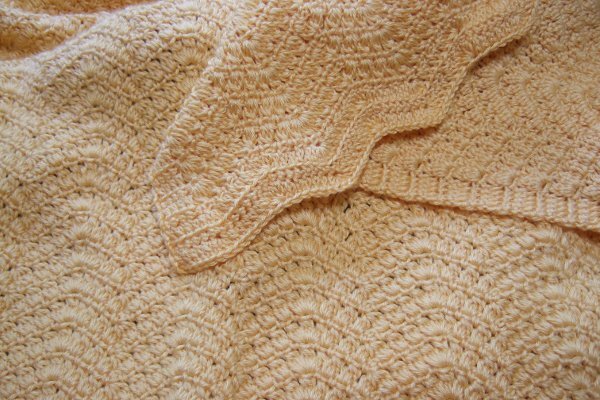 I struggle with written patterns – do you think you might ever do a video tutorial on this blanket? I just love it! I have a question about row 5. When I first did row 5, it turned out fine. But when I came around the second time, there were only 5 sc and one ch space, rather than 6 sc and one ch space. Am I doing it wrong? Row 4 begins and ends with 6 sc. Row 5 begins and ends with 5 dc. At the beginning of row 5, one of the dc is actually a ch-3. Row 6 begins and ends with 6 sc. Be sure you make a sc in the top of that ch-3 dc. I love all the patterns you so graciously share with us. I do have a question about row 5. Is the (cluster, ch1, cluster) in ch sp done in one stitch and the rest are single clusters or is the first cluster done over 2 stitches? It is done in one stitch (into a ch sp). There is one of these “half peaks” at the two ends of the row. At the other peaks along the row, you will work 3 clusters in one space. Just starting this project. Row 1: when I do the Dec5, should I end with a chain before going into the “dc in each of the next five chains”? It seems awkward to go straight into the next stitches without sort of anchoring the Dec5 with a chain stitch. The problem with adding a chain there is that it would create a gap between the Dec5 and the next dc. It really does work out to go straight into the dc stitches following the Dec5. Thank you so much for sharing your knowledge and your beautiful patterns. I taught myself to crochet as a child to make things for my bears and have recently returned to the craft,decades later. I love working with fiber and making things, but I think the best part about picking up my hook again is meeting/ learning about all the amazing people like you who share their talent and skills so incredibly graciously. There are lots of hard things in life, but the crochet/needle art world seems to be a bastion of kindness and generosity. Thank you again. I am very experienced at crochet, however, I am struggling with Row 5 on this pattern. My stitches are not lining up. I am out 3 stitches. I presume the first clusters in row 5 should be in the center dc of the row 3 (3dc)? Also in your chart for the stitch line up, you have row 5 pointed to x’s and o’s. First one is an “o” with no stitch under it then under the first “x” would be the chain 3? Thanks for your help. I’m sorry my poor hand written chart is hard to follow because the stitches are not clearly aligned. The first clusters are made into the ch-1 space that is over the first of the 3 dc. In row 4, a sc is made in each of the border stitches, a chain is made and the first of the 3 dc is skipped and then a sc is made in the center of the 3 dc. It is a poorly drawn 6, but the x and o row you refer to is row 6. The chain you see at the beginning of the row is the chain needed to make after row 5 to then turn the work. Then a sc is made in the first stitch. There are others that count a chain as a sc as you would a ch 2 for a hdc or a ch 3 for a dc, but I think the ch 1 is harder to find on the return row when used instead of a sc. That’s just my personal preference and since there are many patterns written with that philosophy, that’s what I do as a rule. I have a question about row 6, I am new at this so please bear with me.you have in () to chain one, cs in nest ch sp across row to last 4 and turning chain. SC in each remaining dc and top of turning chain. Turn. My questions are as follows, 1) in the () do I chain one, sc in the next chain and do this across the row? (chain at the top of each single crochet before inserting into the nest ch sp). 2).on the last 4 DC before doing anything, turn the work then sc in each dc then turn the work back around, chain and turn work again? I am a bit confused on the last four stitches. thank you for your time. In row 5 you separated each stitch by a chain. So looking at row 5 you should have a space between each stitch. For row 6 you will make sc in each of those spaces and separate the sc stitches with a chain. Then in row 7 you will work clusters into each of the spaces created by these chain stitches in row 6. The turning chain is just a name for the first chains you make at the beginning of the row. Sometimes they are called the turning chain because they are made at the point you turn the project to work the next row. You will only turn the project at the end of each row. Row 2 is sc across the whole row. The Dec-5 isn’t saying to make Dec-5 stitches but that sc will be made in all the dc and Dec-5 stitches from the prior row. I’m sorry it’s taken me so long to reply. There is a printer/pdf icon at the top of the pattern that you can use to print it or make a pdf. There is a drop down option once you select that to change the size of the text. This will also create a clean version that may be easier to read. I’m just about to throw in the towel on this one. I’ve restarted this afghan 6 times and I can’t get past the begining of row 3. The row doesn’t align after the first two “hills”. What am i doing wrong? I’m sorry it took me so long to get back to you on this. You may have already given up on it. If you haven’t scrapped it, if you could send me a picture of it, I can probably diagnose the issue. Hi, as you can tell I am very knew to crocheting & am trying to teach myself as I go. I began this afghan and things seemed to be going well until row 3, the “hills & valleys” werent matching up. So i back tracked and counted my sc stiches in row 2. I am making the extra large version so i started with 208 ch stiches, but it row 2 i only had 165 sc stitches.. Any idea on the mistake I made? Im assuming this is what is preventing my row 3 from lining up. nevermind! I just realized i was closing of the 5dc together instead of seperately! I have completed the first 6 rows and then did rows 5 and 6 (2x so far) and my blanket is wavy. In other words the blanket is not laying flat. Is this the way the blanket is supposed to be? I’m thinking that its not supposed to be that way. Please let me know as I am anxious to continue or rip it all out and begin again (ughhhh). thank you. Sometimes it can take a while for the ripples to work themselves out. I would need to see it to know for sure. Could you send me a picture? Sorry to post again, but I am stuck. I completed row 5 and 6 and I believe it worked out perfectly. Once I began to repeat row 5 I became confused. In order to line up the clusters I didnt individually stitch & ch between the 3 grouped clusters, instead i stitched and then chained & stitched again over the entire 3 clusters. Is this correct? Also confused about the “dip” part of the pattern. Originally i skipped a chain space but when repeated row 6 if i skip a chain space it shifts the clusters so they dont match. Sorry this was poorly worded and confusing. I can add pictures if this is not clear. I am sure I am missing something because as i continued repeating 5 and 6 the wave starting to diminish into a straight line. There are full “peaks” and partial “peaks” at the two sides. The full peaks have three clusters that were made into one space separated by single chains. When coming back with the sc/ch row, you will have a chain over each of these three clusters with sc between them. For the partial peaks on the ends, you have two clusters that were made in one space. Coming back on the next row they will each have a chain above them with sc between. Then going back again on the cluster row, on the full peaks, you will be working the three cluster peak into the chain space that is above the center peak cluster of the row two below. For the partial peaks, the new partial peak is worked into the chain space above the cluster of the two that is nearest the edge, so the first at the beginning of the row, and the last at the end of the row. Now for the “valleys”. The valleys consist of a decreasing cluster set that look like three clusters at the bottom of the stitch but culminate in a single stitch at the top. The three cluster portion of the bottom of it is worked into three separate chain spaces. When returning in the sc/ch row, there will be a single chain over this stitch with sc on either sides of it. When working the next cluster row, the decreasing cluster will be worked into 3 consecutive chain spaces, the center one being the one over the decrease cluster of the row two below. This may be where my mistake is. You state “The valleys consist of a decreasing cluster set that look like three clusters at the bottom of the stitch but culminate in a single stitch at the top.” I had done a cluster, skipped a chain space and clustered again. Is that incorrect? should i have clustered in all three of those spaces and finished them off with one stitch together? — the very last step “yo and draw through all 7 loops on hook” is going to tie the three together at the top to form a single stitch at the top. Absolutely beautiful.I would like to make the bottom border narrower. I read the pattern over several times and it looks like I would be able to start with Row 4 in the starting chain without a problem. I would like your input on that possibility and Merry Christmas! If you want about half of the given border then you can do rows 1 and 2 and then skip to 5. If you want no border then chain 2 less than given in pattern, do this row 4 and then pick up at row 5 – Row 4: Sc in second chain from hook, sc in each of the next 5 ch, (chain one, skip one ch, sc in next ch) across to last 5 ch. Sc in each remaining ch. Turn. Thank you ma’am for the quick reply. Still deciding on narrow border or none but I did make a few samples with different tensions (which I would suggest everyone do) because it really changes the look depending on how tight you stitch. I like the defined look of tighter vs a loose bobble. The Caron yarn stays wonderfully soft. I love this yarn, I’ve made quite a few projects with it and no dye lot is a super plus for those times when you come up short. I think this pattern is very pretty and I started making it for a baby gift. I’ve been crocheting for many years and I’ve never had such problems. My stitches aren’t lining up and I can’t figure out why. Are they supposed to? The “peaks” and “valleys” should line up and of course the edges. The other stitches will not. Very beautiful afghan. Thanks for sharing. Going to try it with multiple colors. I love this site and hope to create one of your beautiful afghans. I just started to learn how to crochet from books and the computer. I think it is amazing that one can go on line and find help to learn something new. I was feeling bad that I never asked questions when there was still someone around to answer them (How do you do that?…) I now have a new appreciation for the world wide web. Thank you Mama for sharing and teaching us. I am amazed at how beautiful your work is. I have one question: What is – 3dc – is it three double chains? Is it a treble crochet stitch? I have keyed “3dc” in google search engine and I get many links on how to make a cluster – ???? I didn’t want to bother you with this, but I just really want to try to make this afghan. I have the other stitches and special stitches down, and have used some in the first afghan I made, which was the first time I ever crocheted anything. Finished another one, and want to try this one. Thank you again. It’s just 3 dc stitches all made in the same stitch. How many stitches should I have at the end of Row 6? I am running sadly short, I know it, and cannot figure out why. Total stitches in the row or stitches at the end of the row to complete after the repeated section? Row 6 is just making sc stitches in each of the dc stitches of the edge borders and then for the middle section of the row making sc stitches in each chain space separated by chain stitches. I still cannot figure out row 5, I am frustrated. Can someone walk me through this. HELP I really like this pattern I just can’t seem to get row 5. I must be really crocheted challenged! Are the clusters themselves frustrating or where to place them? In row 4, other than the side edges, you made sc stitches every other stitch separated by a chain. For row 5, other than the side edges, you will be making the clusters in this ch-1 spaces between the sc stitches. All the clusters will be separated by chains. In the first ch-1 space you will make two clusters. This ch-1 space of row 4 is above the first dc of the 3dc in one stitch of row 3. The two clusters made in this space are separated by a chain and then a chain is made after. The next cluster is in the ch-1 space of row 4 that is above the third dc of the 3dc in one of row 3. Then a chain and the next cluster is made in the next ch-1 space. This ch-1 space of row 4 is above the 2nd dc of “dc in each of the next five sc” of row 3. Chain and then make a DecCluster. The DecCluster is like three clusters at the bottom of the stitch, but joins into a single top. The three bottom parts of the DecCluster is in the next three ch-1 spaces. These ch-1 spaces are as follows: the ch-1 of row 4 above the 4th dc of “dc in each of the next five sc” of row 3, the ch-1 of row 4 above the Dec5 of row 3, and the ch-1 of row 4 above the 2nd dc of the next “dc in each of the next five sc” of row 3. Chain and make the next cluster in the ch-1 of row 4 above the 4th dc of “dc in each of the next five sc” of row 3. Chain and make a cluster in the ch-1 of row 4 above the first dc of the 5dc in one of row 3. Chain and make (cluster, chain, cluster, chain, cluster) in the ch-1 of row 4 above the center dc of the 5dc in one of row 3. Continue in this fashion. The three clusters in one should always line up vertically above the center of the 5dc in one and the DecCluster center cluster should always line up with the Dec5. On future cluster rows these “peaks” and “valleys” should always line up vertically. I’m fairly new at this but I was wondering if you would answer a question for me before I get too far along. I’ve already started over twice after getting to the end of row 3. My question is this: I’m working the large pattern (192 chain). After completing row 2, sc all the way across, I end up with 187 stitches. Is that right because of the decrease? Any reassurance or correction is greatly appreciated. I’m absolutely loving your site, by the way, and this afghan is gorgeous. Now, if I can just teach myself how to do this! LOL! You should have 189 stitches at that point. The increases and decreases equal out to keep a constant number of stitches per row. The 3 stitch difference between the initial chain and the resulting number of stitches is 3 chains that formed the initial dc. Thank you so much! I do believe I’ll be starting over one more time. I must have placed my second dc in row one over one too many in the starting chain which, when I recounted, left me with 188 (not the 187 I originally thought). So close and, yet, so far! Sigh… But I am learning a lot! I’m having problems with the DecCluster. Where do you get 3 clusters from when your only working in two ch spaces? Where is the other cluster to make in the the other ch space. Thanks. Loving this pattern. The center chain is skipped, but I count it as being “used” since it is in the footprint. The DecCluster is basically three clusters at the bottom of the stitch which are made in three separate chain spaces but at the top are all joined into a single stitch. Second row, when I’m coming up to the dec5, there is a stitch and also a stitch after the dec5. Do I sc in the stitch before and after the dec5, they don’t belong to a dc?? I think this is why others are having problem with the 3rd row… thank you in advance. There should be nothing but dc and dec5 stitches in row 1. So going along the row you will sc in each dc of the 5dc in one stitch, in each dc of the “dc in each of next five ch” and in each dec5. I have tried the pattern a few times and can’t seem to get the clusters to line up. I think I’m getting confused. When i turn the row where do I place the first stitch. For example, when i finish row 1 and turn to start row 2, where exactly does the first sc go? In row 4 at the end of the 6row it says to place a stitch in the turing chain. I might be starting the row off in the wrong place. Help. When making sc stitches, the sc goes in the first stitch because the turning chain stitch is not counted as a sc. When making dc stitches, the dc goes in the second stitch because the turning chain counts as a dc stitch. If you can send me a picture of it, maybe I can tell what is happening. I have to say that I’ve made this afghan 4 times now and every one is a little different. But looking at the diagram and the comparing to the written…it says there are 2 clusters in the valley…but the diagram has 3. Have I been doing them wrong this whole time? And with my 5th, I’m going to have another different one?